Beautifully charred Chinese eggplant is topped with a flavorful garlic sauce with minced turkey sausage and a bit of heat! In the oven, place a rack up high about 10 inches from the heat. Preheat on broil. Place the eggplants in a single layer on a baking sheet and brush with one tablespoon of the safflower oil. Sprinkle with Kosher salt and turn the eggplant cut side down. Broil for 12 -14 minutes, turning the eggplant over halfway through. The eggplant should be lightly charred. Remove from the oven and let sit. Meanwhile, in a large bowl whisk together the soy sauce, rice vinegar, sambal oelek, and cornstarch. Add in the minced turkey sausage, breaking it up and coating with the marinade. Set aside. In a medium bowl, whisk together the chicken broth, sake, sesame oil, honey, and chile bean sauce. Set aside. Using a large wok or heavy skillet, heat the remaining safflower oil on medium high heat. Add the minced garlic, green onions, red and yellow bell peppers, and ginger. Stir-fry until fragrant, about 2 minutes. Add in the sauce and turkey mixture and bring to a low boil, then simmer for 5 minutes or until thickened. 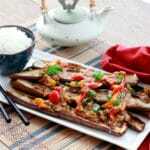 Arrange the eggplant on a platter and spoon the garlic sauce mixture over the top to desired amount. Garnish with more chopped green onions. Serve with a side of steamed white rice. Chinese eggplant can be tricky to find. I get mine at my local Asian farmer’s market, but sometimes smaller gourmet grocery stores carry them as well. You can always substitute regular eggplant for the Chinese version. It will taste pretty much the same in this dish. You can also substitute chile bean sauce for Sichuan bean paste which can be found at most Asian markets and specialty stores. If you’d rather use a protein besides ground turkey sausage, feel free. I would recommend pork sausage as a substitute.